Every Barbie needs a Ken, and now he has his own teaser poster. Pixar has released our first look at the new, anatomically incorrect Toy Story 3 character. Yep, that’s Ken alright. Plastic hair, horrible fashion sense. I’ll never understand what Barbie sees in him. Here’s Ken’s package description: Grab your binoculars and join Ken on a safari! 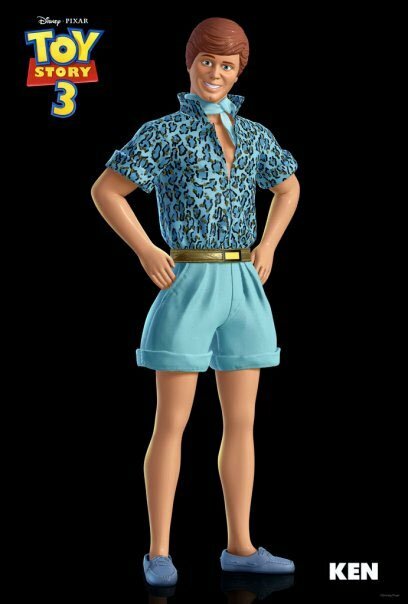 A swinging bachelor who's always on the lookout for fun, Ken sports the perfect outfit for his eco-adventure: light blue shorts and a leopard-print shirt with short sleeves sure to keep him cool in the hot sun. And after his exciting expedition, Ken will be ready to hit the dance floor in style. His accessories include matching scarf, sensible loafers, and a fashion-forward gold belt. Dozens of additional Ken outfits sold separately. In case you missed it, check out the other newly introduced Toy Story 3 character, Peas in a Pod right here.